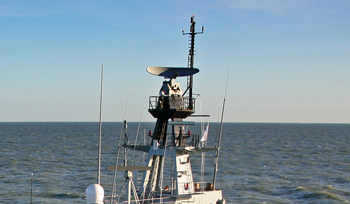 Easat produces mid-range radar systems and antennas for ships, as well as land applications. The company is also involved in the development of 3D radar solutions. Easat EA45075 radar antenna is installed on the Royal Navy's offshore patrol vessel, HMS Clyde. It provides two separate elevation beams, one optimised for air surveillance, the other optimised for sea surveillance. 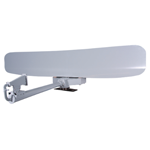 The EA45075 antenna is based on a lightweight carbon fibre composite parabolic reflector with two RF feed horns providing air and sea beams. The antenna includes selectable horizontal and circular polarisation on both air and sea beams to ensure optimum detection performance in all weather conditions. Polarisation can be individually selected for each beam. The antenna can also accommodate various forms of IFF antennas. The EA45075 antenna offers sub 0.52° azimuth 3dB beamwidth providing high-performance range and azimuth resolution and excellent target discrimination at long range. The air beam provides inverse cosec2 shaping for constant target illumination; the sea beam provides a modified pencil beam for long range detection and reduced rain and sea clutter. Unable to open PDF documents? Please download	Adobe Reader for free from Adobe's website. Simultaneous surface and air surveillance mode for the tracking of small surface and air targets. Navigation mode for vessel navigation in confined waters.